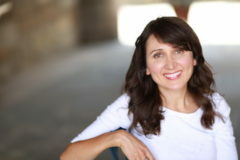 Andrea Caban is Head of Voice & Speech in the Theatre Arts Department at CSU Long Beach, Associate Director of Knight-Thompson Speechwork and Associate Specialist in the UCI Department of Neurology. She is the accent expert on HowCast.com demonstrating over 35 accents, a theatrical production coach, a regular speaker coach for TED, and a community based theater maker. An award winning solo artist, Andrea has performed her original works in Colombia, the UK, South Africa, Costa Rica, Spain and across the US. She has adapted actor voice and accent training for the care of people living with ALS to prolong the ability to speak without assistive devices. To learn more about her solo play THE VOICE BANK, her research, the integrative course The Living Speech Series, or the community based theater project she created with students, DREAMERS: AQUÍ Y ALLÁ, visit andreacaban.com. MFA, UC Irvine.